Agriculture plays a critical role in both providing nutritious food and addressing the underlying causes of malnutrition. Feed the Future’s investments in USAID’s multi-sectoral nutrition project, SPRING, has revealed several opportunities for agriculture to contribute to improved nutrition, especially for those most at risk. By addressing these opportunities in current and new agricultural activities, USAID and its implementing partners will more effectively contribute to better nutrition. Here are five things that can be done now. Greater diversification of farming systems and markets is critical for ensuring availability of and access to a balanced diet. Use of good agricultural practices increases yields, protects or improves the environment and ensures better quality food for all. Efforts to diversify and expand farming systems must also contribute to increasing family income, making a diversity of foods more convenient and affordable and promoting gender equity so that nutritional needs are met throughout the year. Agriculture is the primary livelihood of most rural households in the developing world. We know that families dependent on agriculture to make a living are highly vulnerable to environmental shocks and stresses. By increasing and diversifying income streams, agriculture activities can reduce the potential impact of future risks. With additional income, families are better able to make informed, joint decisions about household purchases that can contribute to healthier diets and better health and child care. New technologies, from mechanized planters, rippers and pumps, to mobile banking, save time and energy. When activities introduce these technologies, along with a more equitable workload, they can also encourage men and women to use newly available time for child- and self-care. This is especially important for pregnant and lactating women and children under two, as this is when nutrition and health care needs are greater and when stunting can be prevented. The agriculture sector has the opportunity to help families make healthier choices. Donor- and government-funded programs and the private sector can build demand for safe, nutritious foods through product marketing, by increasing consumer knowledge of nutrition and by making healthy foods more convenient, especially for adolescent girls and women of reproductive age. New or existing national policies and development activities can explicitly support nutrition through a multi-sectoral approach. Public-private partnerships in the food system, as well as women’s empowerment, advocacy efforts and capacity building among value chain actors, are paramount to reach this end. 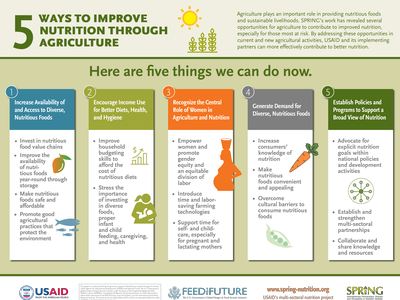 Check out the 5 Ways Agriculture Can Improve Nutrition Infographic on the SPRING website and be sure to explore our many resources to help implement nutrition-sensitive agriculture programs while you are there. Heather Danton is the Director of Food Security and Nutrition on the SPRING project.